It is very gratifying that so many members of the bench and bar have come to rely on this book. I am pleased that earlier editions have received such positive reviews in the New York Times, New York Law Journal, the New York State Bar Journal, Ballot Access News and the Election Law Journal. In this Fifth Edition, I have tried again to incorporate as many appellate and trial court decisions as possible – so readers have a broad range of source material to use. My work stands on the shoulders of Benjamin Gassman, Lewis Abrahams and Edward Byer, all authors of previous election law treatises in New York. I thank them for their contributions to the field. I also thank my current colleagues in the election law bar for their generous assistance in improving this work. As before, I particularly thank my colleagues at Stroock for providing me the opportunity to practice and write, and to those at the Fordham Law School and University of Pennsylvania Law School to teach Election Law. I especially am grateful to my terrific students at both schools. It may be a cliche´, but it is nevertheless true that I learn more from my students than can be measured. They always provide useful insights, and keep me on my toes. And their enthusiasm has sustained my own interest and faith in the electoral system. Of course, our Republic will survive only if we are vigilant in protecting our precious institutions and the rule of law. * William H. Rehnquist, CENTENNIAL CRISIS: THE DISPUTED ELECTION OF 1876 (Knopf 2014), at 210. Also includes the NYS Board of Election Rules, and the NYS Election Law. 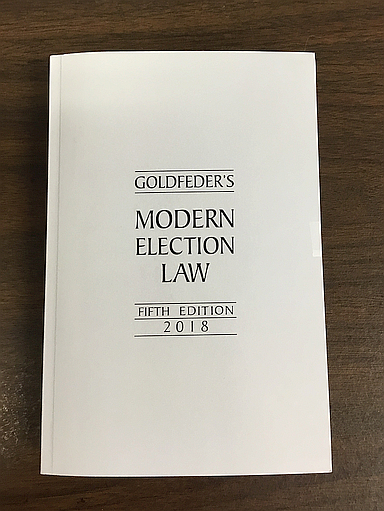 The Fifth Edition also includes election cases through March 2018, including recent state and federal rulings on residency requirements, candidate eligibility, recount laws, Wilson-Pakula procedures and jurisdictional matters. You will want to be up-to-date! Purchasers are also entitled to our new periodic Election Law Update that will be sent at no cost. JERRY H. GOLDFEDER is Special Counsel at Stroock & Stroock & Lavan, LLP, specializing in election and campaign finance law, government relations and public integrity defense.